Chocolate, beer, fries, waffles, comics and lace: Belgium is famous for the essential things in life. It is also famous for having been the battlefield of Europe—which in a diplomatic sense it still is, as the capital of the European Union. There are many reasons for the appeal of this small kingdom between France and the Netherlands: its pivotal role in the economy and politics of Europe, its beautiful countryside, and the allure of its cities—the dazzle of Antwerp and its diamonds, the beauty of Ghent, the romantic atmosphere of Bruges, and the international importance of Brussels. The territory that is now modern Belgium passed through several hands over the centuries. It was a Roman province more than 2,000 years ago. In the early Middle Ages certain regions of “Gallia Belgica”, as the Romans called it (after the Belgae, the area’s first inhabitants) were annexed by France and by the Holy Roman Empire. In the 15th century most of the region became part of Burgundy, and its cities became major centres of commerce and culture, specifically Antwerp, Ghent, Brugge, and Brussels. The Belgian textile industry became one of the biggest industries of northwestern Europe. 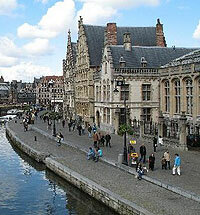 Belgian commerce boomed from the Middle Ages to the 17th century. There was a growing international appreciation of Belgian culture, and of its great artists during the latter half of this period: Rubens, Bruegel, and van Dyck. Over the centuries the region passed to Spain, then to Austria and France. It came into the Netherlands’ possession in 1815, but 15 years later the Belgian Revolution broke out. In 1839, Belgium finally became a sovereign, independent state. By this time the Belgian monarchy had already been established; in 1831, Leopold of the House of Saxe-Coburg became the country's first ruler. The borders of Belgium were drawn up. The new country absorbed part of Luxembourg from the Grand Duchy (which had itself become independent), but lost parts of Limburg and Flanders to the Netherlands, and the western part of Flanders to the French. For centuries battles were fought over Belgium, and it became known as the battlefield of Europe. Independent Belgium once again became a battlefield during both world wars, and Germany invaded it both times. After World War II, Belgium became a founding member of the European Economic Community and later the European Union, and Brussels is the EU’s unofficial capital. The geographical centre of the European Union from 1995 to 2004 was in Belgium, in the town of Viroinval in the southern province of Namur. The interior of Belgium is generally low-lying and level, with some valleys. It then rises higher above sea level further south, with the broadleaf and fir-forested hills of the Ardennes in the southeast. There are many rainy days in Belgium, but the country also enjoys a temperate, maritime climate, with cool summers and mild winters. Because it is a bilingual nation, most places in Belgium have two names: a French one and its Dutch variant, or vice-versa. The upper half of the country is mostly Dutch-speaking and the lower half is mostly French-speaking, and while there are political tensions between the two groups (leading to the federalization of the country), the Flemings and the Walloons generally live together in peace. During the Industrial Revolution, the area known as the sillon industriel in the Walloon region was heavily mined for coal, iron and other resources. Flanders’ economy was mostly agricultural. Today a huge part of the country’s economy comes from the service sector. This is especially true of Brussels, which contains all levels of local and European bureaucracy. Belgium’s main industries today are metals, chemicals, food processing, agriculture, and textiles. Belgium faces some serious environmental problems. The Senne River passing through Brussels was so polluted that it had to be covered. The industrial towns of the sillon industriel can be grimy and polluted. Yet nature is rich in Belgium: miles of hiking and bicycle paths wind through forests and up hills. 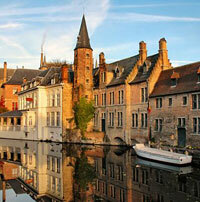 Belgium’s rivers and their tributaries provide kayaking, sailing and fishing. In winter, the steep river valleys are good for skiing. Holidaymakers can ride the Kusttram (Belgian Coast Tram) from one end of West Flanders to the other along the North Sea coast and make several stops along the way. There are 15 resorts and beaches along the 65-kilometre stretch, which is especially popular during the summer months. 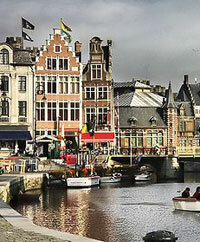 The great cities of Belgium are historical and cultural centres. Every city—from sophisticated Antwerp, one of the world’s great diamond centres, to cosmopolitan Brussels, the diplomatic centre of Europe and the capital of Art Nouveau, to rustic Redu, a tiny town that hosts a big book market and the high-tech Europe Space Centre—has something to offer, as well as more conventional attractions like parks, museums, shopping areas, open-air markets, and city squares. 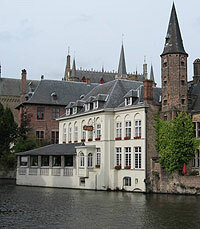 Belgium’s cities are also showcases of architectural styles. Many of the country’s cathedrals, churches, abbeys, town halls and old houses are Gothic and date from the middle and late medieval period. The newer and more affluent neighbourhoods have much Art Deco and Art Nouveau architecture of the 1920s and 1930s. There have been some attempts at popularizing other styles, with varying degrees of success: Victor Bourgeois’ social housing complex, the Cité Moderne, was designed in the minimalist style of the Dutch modernists and did not take off as he had hoped, while at around the same time neo-Gothic and neo-Renaissance architecture was widely used in Brussels and other large cities. 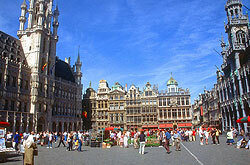 With a total land area of 30,528 square kilometres and a population of 10.5 million, Belgium is not a large country. It is divided into three regions: the Flemish region (also known as Flanders), the Walloon region (often called Wallonia), and the Brussels Capital Region. Flanders is for beer lovers. The hundreds of varieties of the true, the blushful ales and lagers of the Flemish Region form its lifeblood, from the rich, strong dark ales brewed in old Flanders abbeys to the light wheat beers that have been a tradition of the village of Hoegaarden for centuries. The world’s largest brewer is also based in the region. But beer isn’t the only attraction of the Flemish region. The cities of Antwerp, Brugge, Leuven and Ghent are steeped in history and culture and famous for their Old World beauty and architecture, their cobblestoned streets, verdant parks and Gothic cathedrals. The delicate constructions of the cities’ lace makers are also much prized. Flanders spans three countries—France, Belgium and the Netherlands. Belgian Flanders, or the Flemish Region, is the largest of the three parts. It takes up slightly less than half of the entire country. The region’s official language is Belgian Dutch, and many people here speak excellent English as well. The region enjoys a temperate maritime climate and a landscape of flat polders and forests, crossed by rivers and gentle streams—views immortalized in the works of the great Flemish masters, from the fantastical visions of Bruegel to the more realistic styles of Rubens, Van Dyck and Van Eyck. At the northern end of the region is the North Sea, which also figured in Bruegel’s work. Having some of the busiest sea lanes in the world, Belgium’s North Sea coast ports are big and profitable. Two are in West Flanders, the only Belgian province that faces the sea. Though the officially bilingual Brussels Capital Region is inside the Flemish region, it is not considered part of Flanders and is a separate region in itself. The Flemish Region is divided into five provinces: Antwerp, Limburg, East Flanders, West Flanders and Liège. Each province is divided into smaller administrative districts, or arrondissementen. Wallonia, or the Walloon Region, has more castles than you can shake a stick at. There is a castle for every 25 square kilometres, a castle for every 5,000 Walloons. This is especially the case in the western province of Hainaut, but the other provinces have their own share of aristocratic estates. Many, such as the 17th century Chateau Lavaux-Ste.-Anne in Namur, are open to the public for at least a portion of the year. There are old fortifications, the most famous being the Citadel of Namur, built as a defence against invaders 1,500 years ago. And there are old abbeys and monasteries, which produce many of the region’s famous beers and cheeses. The fairytale quality of these castles—medieval strongholds with moats and turrets and vast gardens—is quite a contrast to another interesting aspect of Wallonia. Running straight across the region (and so called its backbone) is the sillon industriel, a long valley that is the site of the coal mining and steel making industries that bolstered Walloon’s economy, especially during the Industrial Revolution. It is sometimes still called by that name, even though its heavy industries have shrunk in importance. On either side of this area are Wallonia’s agricultural lands—capital- and labour-intensive farming in the north, extensive farming in the south. Wallonia has abundant natural resources—nature reserves, woodlands, moors and the rural countryside. There are hundreds of kilometres of marked paths for hiking, climbing and biking, which wind through the towns, fields and the abundant forests and gently rolling hills of the Ardennes in the southeast. The inland waterways Meuse, Scheldt and the Rhine, their tributaries and manmade canals have proved invaluable to Walloon trade and commerce over the centuries. These days they draw tourists, who go on boat rides, kayak down the Lesse River, or visit the locks and boat lifts that are a testament to Belgian engineering. There are dozens of museums preserving treasures in every field—art, history, archaeology, science and even comics. Five southern provinces make up the Walloon Region: Walloon Brabant, Hainaut, Liège, Namur and Luxembourg. The region’s official language is French, but German is also spoken by a minority in the east. 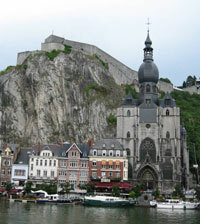 The region’s capital is Namur. About one-third of all Belgians consider themselves Walloons, the French-speaking portion of the population. In September, Wallonia holds Heritage Days. Old houses usually closed the rest of the year become open to visitors. Exhibitions, activities for children, and walking tours in many cities and towns are held. These days are called Journées du Patrimoine, because they allow Belgians to rediscover their rich cultural heritage. There are about 500 such events held in the five Walloon provinces.